This collection of mystery and horror stories is regarded as Japan's answer to Edgar Allan Poe. Japanese Tales of Mystery & Imagination, the first volume of its kind translated into English, is written with the quick tempo of the West but rich with the fantasy of the East. These nine bloodcurdling, chilling tales present a genre of literature largely unknown to readers outside Japan, including the strange story of a quadruple amputee and his perverse wife; the record of a man who creates a mysterious chamber of mirrors and discovers hidden pleasures within; the morbid confession of a maniac who envisions a career of foolproof "psychological" murders; and the bizarre tale of a chair-maker who buries himself inside an armchair and enjoys the sordid "loves" of the women who sit on his handiwork. Lucid and packed with suspense, Edogawa Rampo's stories found in Japanese Tales of Mystery & Imagination have enthralled Japanese readers for over half a century. It has some of his best short stories, The Human Chair, The Caterpillar. Erotica,grotesque nonsense, is a great Era of literature for Japan that arose in the decades following WW2. It is Definitely worth a read for the stories as well as a glimpse into where literature was in Postwar Japan. 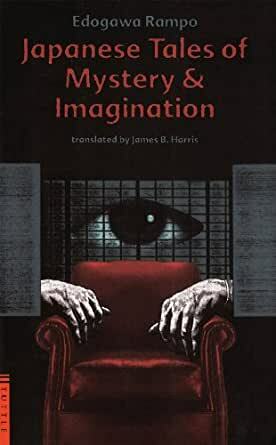 Creepy and atmospheric, "Japanese Tales of Mystery & Imagination" partakes deeply of Poe's work and not quite enough of the author's culture and experiences. In my eyes, only one story (about the human caterpillar) added original elements to the background of 19th century horror. However, this homage is excellent for what it is, just perfect for curling up in a large chair in a candlelit room with several mirrors on a stormy night. 2.0 out of 5 starsFor a low price and convenience of e-book, you somehow get horrible editors and proofreaders. I like couple stories a lot, most of them are meh/okay/intriguing. I bought this as e-book so I can read at work. Don't buy the e-book if you get easily upset by obvious misspellings. I don't know who made the e-book version but they did not proofread thoroughly at all. Stories are about crime plotting. Except for one, the plots are childish or, simply, unbelievable..That said, the one that stands out makes reading the collection worthwhile! With so many crime novels being published everyday, creating (or, should I say discovering) a new way to kill and not be blamed, is quite a success. The Human Chair and The Caterpillar are favorites and I think the most widely known of Rampo's short stories. Sometimes bizarre, sometimes mystical, all his stories show imagination and the weirdness of being human. Happily the last story ends the collection with a bit of tenderness.